If you haven’t seen Sunday night’s installment of Breaking Bad—the premiere episode of the second half of the final season—stop reading now. Something big and surprising happens at the end of the episode, and that’s what this story is all about. I don’t want to spoil it for you. Come back after you’ve caught up. Sunday’s Breaking Bad premiere picked up right where last seaon left off: with detective Hank Schrader realizing on the toilet that his mild-mannered brother-in-law Walter White is actually Heisenberg, a murderous, meth-cooking criminal mastermind of epic proportions. It was like Ahab finally spotting his White whale. 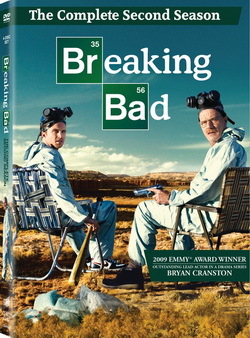 What most viewers probably didn’t expect was that Hank would decide to confront his mark—or that Walt would discover he was being hunted—anytime soon. I assumed that Hank would take his time—that his cat-and-mouse game with Walt would be a major part of the final season’s overarching narrative. Ever the professional, Hank would observe, investigate, and wait for the perfect moment to spring his trap. How wrong I was. After spending a few days in a state of strained, red-eyed shock–he calls in sick after plowing his car into a neighbor’s yard—Hank decides to plant a GPS tracker on Walt’s car. Meanwhile, Walt is happily retired—until his cancer comes back. As he leans on the toilet between bouts of vomiting, he notices that his copy of Leaves of Grass is gone. Then Skyler tells him that Hank is working a case from home. Suspicions aroused, Walt walks outside and reaches under his bumper. Bingo. The tracker. This sets up the remarkable encounter at the end of the episode. Walt stops by Hank’s house. He’s officially there to check up on Hank’s “illness,” but his real purpose is to detect if Hank is on to him. He seems to be.